How Can You Tell If Your Dog Has a Broken Leg? Bone fractures in canines are defined as either "open" or "closed." An open fracture is a more serious, deeper wound, revealing the bone underneath. If the bone is visible and exposed, this is a clear indication that a dog has suffered a broken bone. Common signs that indicate that a dog has suffered from a broken limb include limping; whimpering or crying, indicating that the dog is in severe pain; swelling of the affected area; inability to bear weight; and obvious deformity of the leg. Deformities that result from broken bones can be easily overlooked. Often, broken legs appear shorter than they naturally are. Examine the dog's leg carefully from a distance to be certain that the bone is broken. The main causes of broken bones in dogs are vehicular or traffic accidents and falls from great heights. If a dog has been in either of these situations recently, it is more likely that they could have possibly suffered a broken leg in the process. Notably, these symptoms are not always indicative of an actual broken leg. Muscle, ligament, and tendon injuries can cause similar behavior in dogs and are equally as common. Always consult a veterinarian if there is any doubt whatsoever. Is There Special Aspirin Made Specifically for Canines? What Are the Symptoms of Cushing's Disease in Dogs? 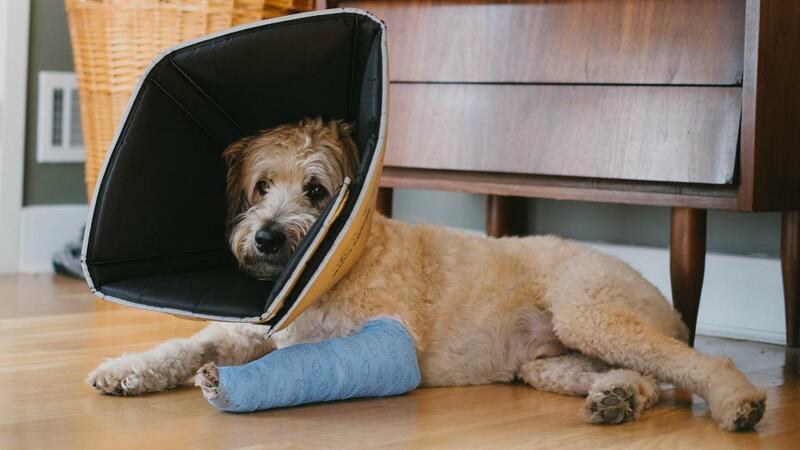 How Can I Help My Dog's Broken Leg to Heal? How Do You Prevent a Dog From Getting Ticks? How Long Do Female Dogs Carry Their Puppies? Can I Give My Dog Sleeping Pills? How Do You Check Your Cat's Symptoms? Does Baby Oil Kill Fleas on Cats? Why Is My Dog so Thirsty? What Should Someone Do for a Dog That Swallows a Bone?